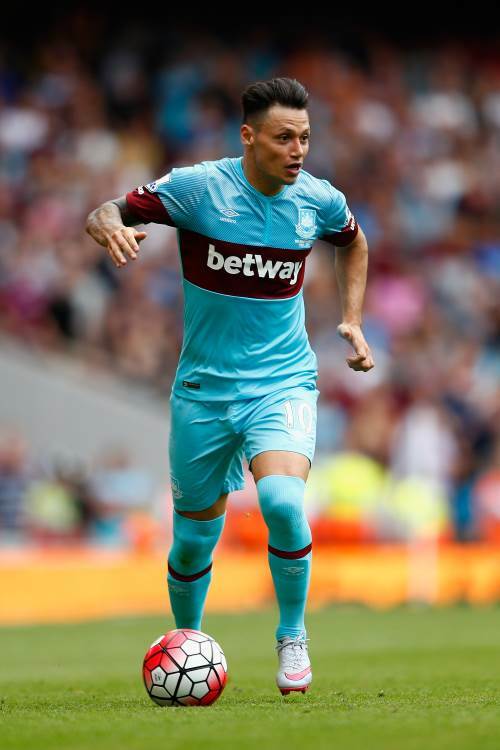 West Ham United co-chairman David Gold has congratulated Mauro Zarate after he scored his 100th career goal at the weekend. Zarate struck in West Ham's 2-1 Premier League win over champions Chelsea and in so doing notched up a century of top flight goals. The Argentine forward found the back of the net 49 times for Velez Sarsfield, four times for Al Saad, four times for Birmingham City, 34 times for Lazio, three times for Inter and so far has six goals for West Ham. And Gold has been keen to congratulate Zarate for his feat. The West Ham supremo took to Twitter to write: "Mauro Zarate's goal against Chelsea was his 100th goal Velez 49, Al sadd 4, Birmingham 4, Lazio 34, Inter 3, West Ham 6. Congratulations." Zarate will be bidding to add to his goals tally throughout the season as West Ham aim to record a memorable final campaign playing at their Upton Park home. The Hammers, under Slaven Bilic, have already beaten Arsenal, Manchester City, Liverpool and Chelsea this season. They are next in action away at Watford on Saturday before then hosting Everton the following weekend.